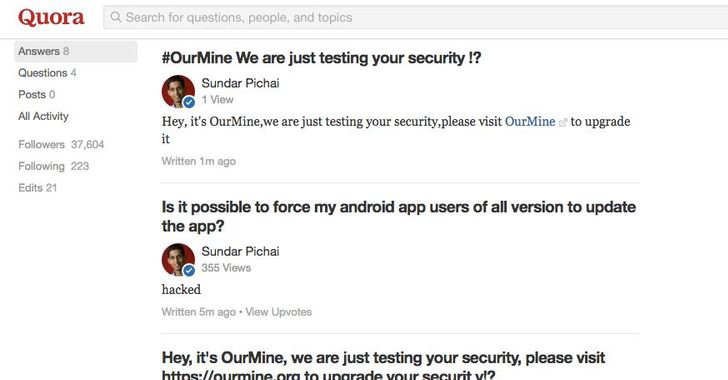 After hacking Mark Zuckerberg’s Twitter and Pinterest accounts, Hacking group OurMine has successfully hacked the Quora account Google CEO Sundar Pichai and then cross-posted to his Twitter account. The hack became apparent when OurMine posted messages on Quora through Pichai’s account, which then appeared on his official Twitter feed late Sunday night — Thanks to the two accounts being linked. All the tweets in question have since been removed from Pichai’s Twitter feed. Unlike Mark Zuckerberg, the three-man team Saudi hackers group did not use password exposed by 2012 LinkedIn data breach; rather they claimed to have discovered a vulnerability in Quora, which is a Q&A community launched in 2010. The group behind OurMine claims it is "testing security" of accounts and teaching people to secure their online accounts better. "We are just testing people security (sic), we never change their passwords, we did it because there are other hackers can hack them and change everything," OurMine told The Next Web. OurMine also said the group shared details of the security vulnerability with Quora but didn’t get any response from the company. The group also offers its support to those it targets, charging up to $5,000 for a "scan" of their social media accounts, website security holes, and other security vulnerabilities. However, instead of encouraging people to upgrade the security of their accounts, OurMine is looking for opportunities to promote and sell their own "services" for which it has already made $16,500.